From Parkland to Chicago and beyond, young Americans in 2018 have catalyzed a historic moment for youth activism. Now, this youth-led movement is pushing to tackle systemic causes affecting our world -- education, immigration, discrimination, climate change, and more -- by unleashing their power at the polls. DoSomething.org is powering the movement online and on-the-ground by mobilizing hundreds of thousands of young people around the country. We’ve created a suite of voter registration tools to rally our membership base of 6 million young people (ages 13 - 25) with everything they need to engage as many people in their communities to register and get out the vote. These tools are designed with the ability to be customized for you -- we can rapidly spin up impactful, branded pages to get your audience registered to vote. We developed a flexible online voter registration portal that allows us to generate landing pages to fit the tone, look, and branding of your organization. 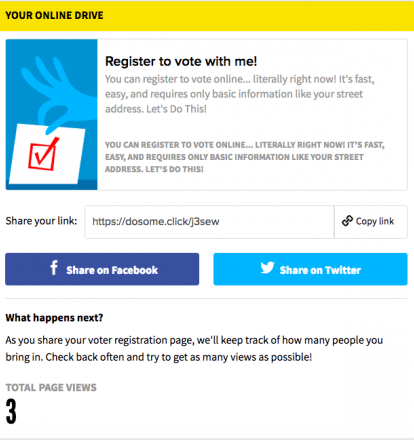 An online voter registration form is embedded, powered by Rock The Vote. Whether you’re an influencer who wants to rally your audience or a marketing partner who wants to activate people passionate about a particular cause space, we built these pages for you. DoSomething simplifies and takes the user step-by-step through the voter registration process via SMS. By setting up a text shortcode for partners and influencers, (i.e., for activist Naomi Wadler, “Text NAOMI to 38383”) young people are able to register to vote on their phones in 2 minutes or less. Love a bit of competition? We do too. Members can also run their own online voter registration drives. Modeled after digital and relational organizing best practices, like Change.org petitions and GoFundMe fundraisers, members running their online registration drives have access to their own customized page as well as basic analytics about how their page is performing. Eligible young people who run online voter registration drives will be entered to win a $3,000 scholarship each month. Voting by absentee ballot should feel just as exciting and important as going to the polls on Election Day. That’s why on October 9, 2018, DoSomething.org is running the first-ever National Absentee Ballot Day to celebrate and encourage voters who make their voice heard by absentee ballot. Held annually on the second Tuesday of October, voters across the country will take pride in mailing their ballots and celebrating with their communities on this day. We are shutting down the noise around low youth voter turnout, and instead celebrating your first time voting as an important rite of passage. This campaign helps first-time voters “Lose Your V-Card”...by registering to vote! This campaign establishes the act of voting as a social norm (everyone’s doing it!) and capitalizes on a young person’s sense of FOMO. Beginning November 1, young people who sign up for Lose Your V-Card will also be able to “Find their V-Spot,” and will receive a text message with their polling place. Coordinating, training, and equipping young people to run on the ground voter registration drives is difficult. To address that, we’ve designed a flexible framework to train people on how to run voter registration booths in their communities. Our campaign includes information about picking the right location, using the right voter registration forms, and pro tips from other young people who have run drives themselves. Eligible young people who run an on the ground drive will be entered to win a $3,000 scholarship each month. Young people can also apply to receive a $50 micro-grant or voter registration kit to help run their drive. We create all the content that you need for your engagement efforts. Two major gaps influence why young people don’t vote: educational and motivational. Across editorial, video, and social media, our content breaks down the voting process for first-time voters and addresses both of these gaps, providing personal stories from other young people, as well as important logistical information (i.e. polling place locator, registration deadlines) to increase the likeliness of young people turning out to vote. WE'RE WORKING TO CREATE THE MOST CIVICALLY ACTIVE GENERATION EVER.